Victoria West Boys and Girls Powerlifting Teams competed at the Goliad “Bars Loaded” Powerlifting Meet on Saturday. West had a solid day and many athletes set personal records. 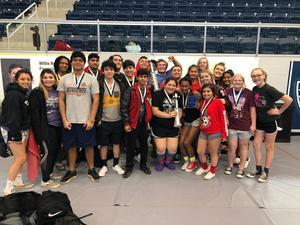 This was the third competition of the year for West Powerlifting. The Victoria West boys finished 2nd at Calhoun and 2nd at St. Joseph. The girls finished 4th at Calhoun and 4th at St. Joseph.